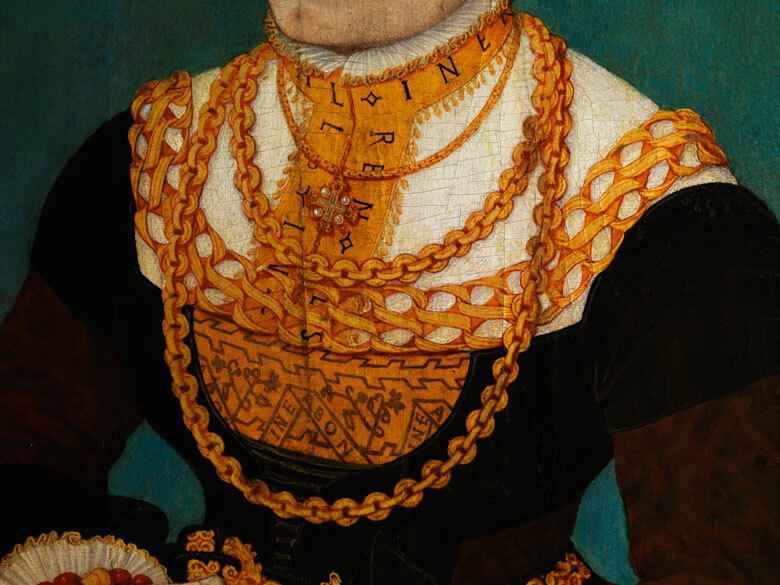 I think in Anglo-centric writings and art history there has been a lot of context missing when interpreting the clothing depicted in the portraits of Anne of Cleves. I have also been looking through modelbuchs at embroidery and found some patterns that seem to be used in art (if not in entirely there are deer/hart that look to be worked in a similar fashion. This phrase has been interpreted to be her personal motto. 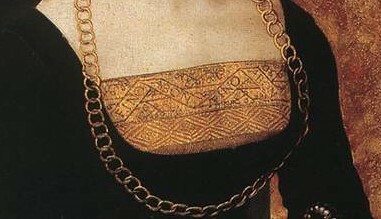 However this same pattern is found on the clothing of other women across the Germanic states. Conrad Faber was active in Frankfort, which is to the South and East of North Rhine. The motto also appears on the brusttuch of Barbara Schellenberger in a portrait by Hans Burkmair. Burkmair was active in Augsburg and this portrait is of an Augsburg citizen. Of special interest is that his appears to be worked in pearls while the previous seem to be woven or embroidered in dark silk on gold, or may even be gold work. Anne of Cleves has this motto in a similar pattern (capitalised on a geometric scroll effect outline, worked in alternating diagonal directions on a wide band. 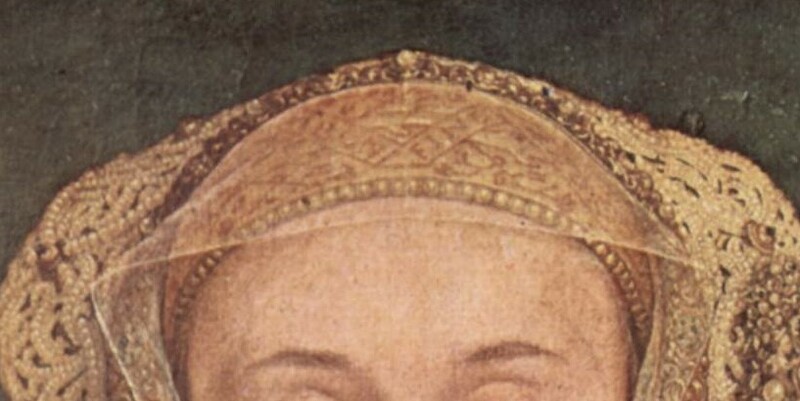 Holbein’s portrait quite clearly show the design worked in red on gold. This may be woven as are most bands on hauben from this region. Most commonly they are purely geometric designs but of a similar scale. Bruyn in particular captures the gold threads of woven patterns of women of Cologne. The design is worked upside down in comparison to all others (and this is repeated in other copies.) It is also worked in a pale colour, in the small digital copies it appears white or off white. So this leads me to the most recently discovered potential portrait of Anna. 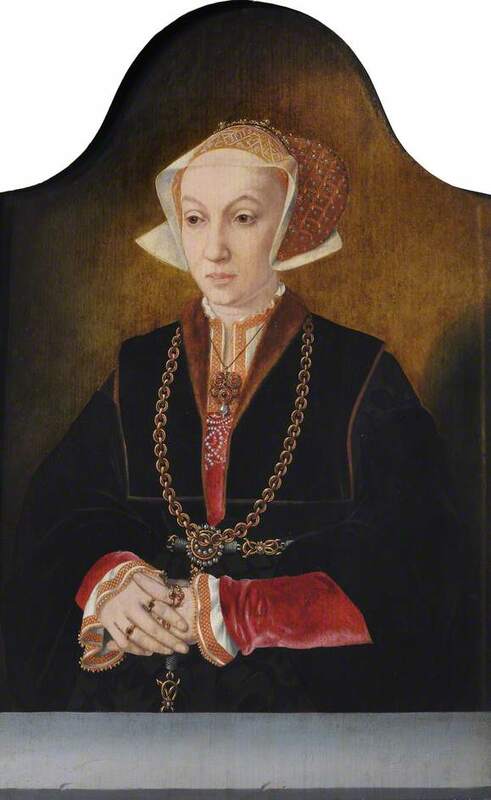 This portrait certainly matches facial features quite closely, and the haube looks the same as those in other Bruyn copies. However after a decade or more of looking at North Rhine paintings what sticks out to me is that this is absolutely not the clothing of Nobility of Cleves, Julich, and Berg. This is absolutely perfect for middle class clothing of Cologne. Very wealthy but very clearly of someone affected by sumputary laws. Red velvet sleeves and busttuchs are found repeatedly in inventories/documents of burgersfrau of Cologne. The pendant is absolutely of a common shape, the girdle of a common type, the single wide chain necklance. Even the black on black fabric of her goller (kleyr) and gown. The partlet under her gown is likewise of a type that puts her firmly in the city of Cologne. It is also quite late in style. I would put this at 1550s. But this stage the Stickelsche (Sticklenchen) starts to look like a wing nut with a flat top and not just width at the upper side but lower side and is quite flat in regards to depth. Commemorative paintings are not unusual, what is unusual is to lower the apparent status of the subject. Gold brocade trim on the gown at the very least would mark the subject as of nobility. The painting looks from the surface to be from Bruyn’s workshop. The curved top of the canvas, the shaded plain background, the flat table top in front of the subject. These are also seen in the other copies of the other Bruyn painting. Without access to information about the painting itself this asks many more questions than it answers. In all the copies the words are upside down and in pale paint on warm gold. Could this indicate they are painted by someone not familiar with the physical properties of these hauben? Could that indicate they are all copies from outside of her homeland? If so how can the details of this portrait match so well to the garments of burgersfrau of Cologne? If this is by Bruyn (possibly the younger) does this mean the princesses could have worn clothing not indicative of their wealth? Or is this a deliberate statement? Or could it be simply a portrait of an unrelated woman from Cologne? There is very little in the way of imagery of real people from Cleves, Julich, and Berg from this time to be found online or printed in books. I have been very lucky to have a copy of the inventory of Jocabe of Juelich-Kleve-Berg but it is very definitely from a time where the Spanish influence has nearly overwritten the local clothing style. I have also been lucky enough to find/be lead to collections of inventories of women of Cologne.